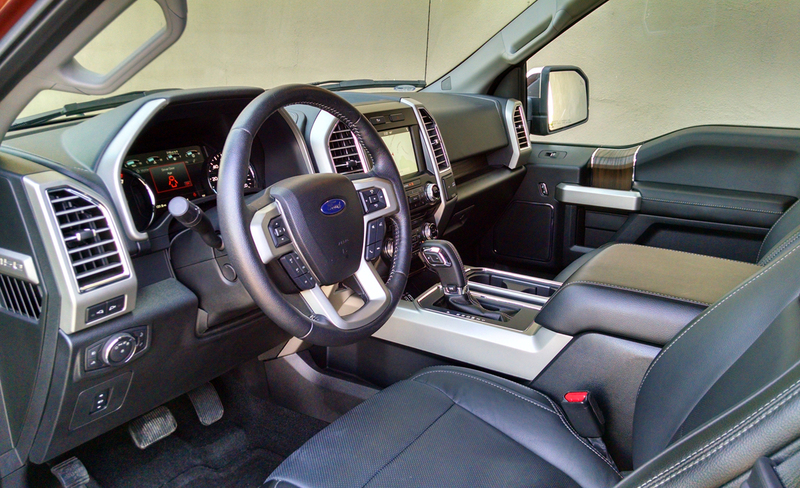 Picking up up the Bronze Fire 2016 Ford F-150 Lariat Crew Cab for the week, the first thing we did as a tradition is gun the accelerator onto the freeway to hear its sound and feel its power. In a pleasant surprise it was a V8 growl, not the engineered thrum of a twin-turbo V6. A welcome sound, this is the first time Ford has given us anything other than an EcoBoost F-150 in years. And while EcoBoost is not a bad thing, nearly one-third of buyers choose the V8 and we’re glad we got some seat time to tell you about it. 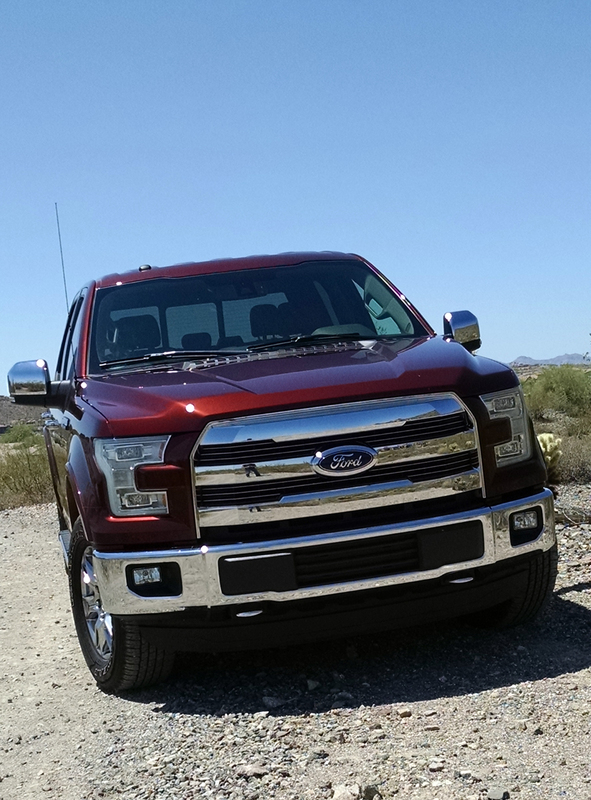 To start with, the Lariat F-150 is a trim grade that falls square between the XL entry point and the new top-end Limited. 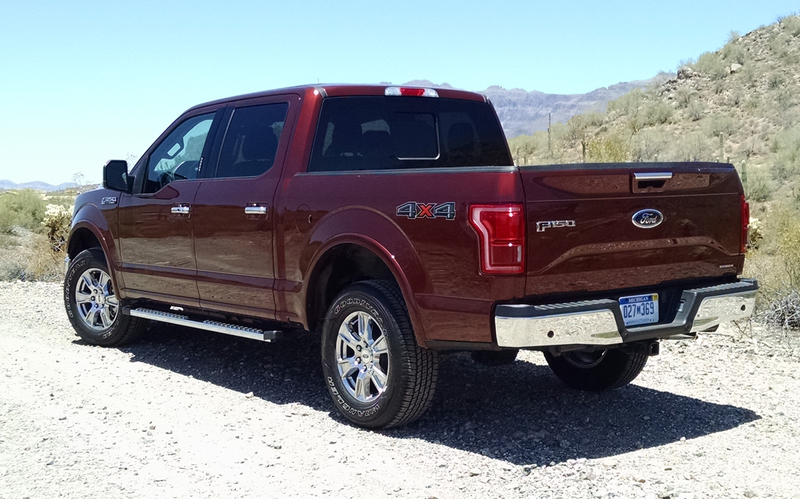 As tested with options, this F-150 is $55,215 which is right in the sweet spot of what Ford sells in large part. Chrome lines about everything it can here, the trim grade unique grille, bumpers, tow hooks, door handles and its rubber gripped fixed running boards. 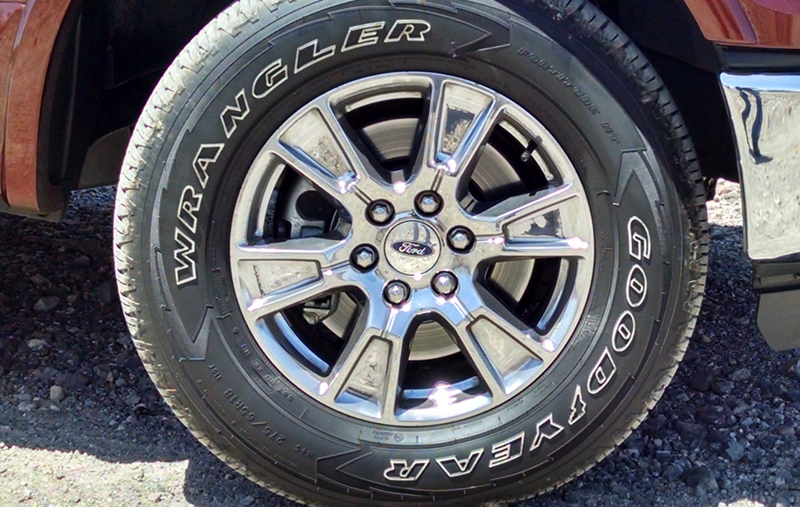 Its 18-inch wheels are chrome too, one of many you can select on the F-150 and chrome too was the exhaust tip. 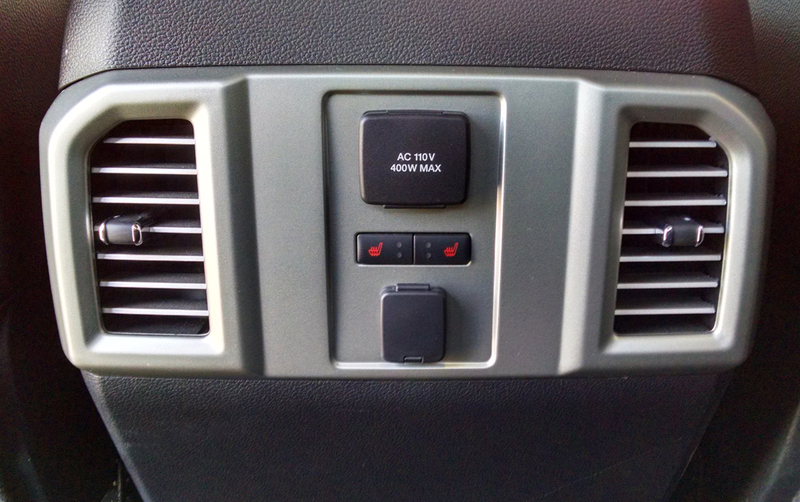 The cabin was lined with black leather seating, chairs that were heated and ventilated up front, heated at the rear. Front seats both had power adjustments with the driver getting memory settings. Wood-grain trim and more of that chrome trimmed things out. 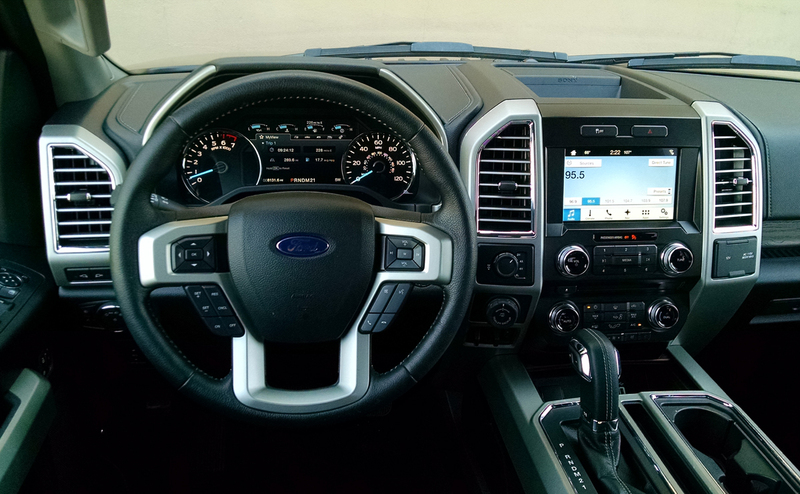 Virtually every option to man was here including an integrated trailer brake controller, Ford’s Pro Trailer Back-Up Assist, climate control and the top-end Sony infotainment system with SYNC 3. 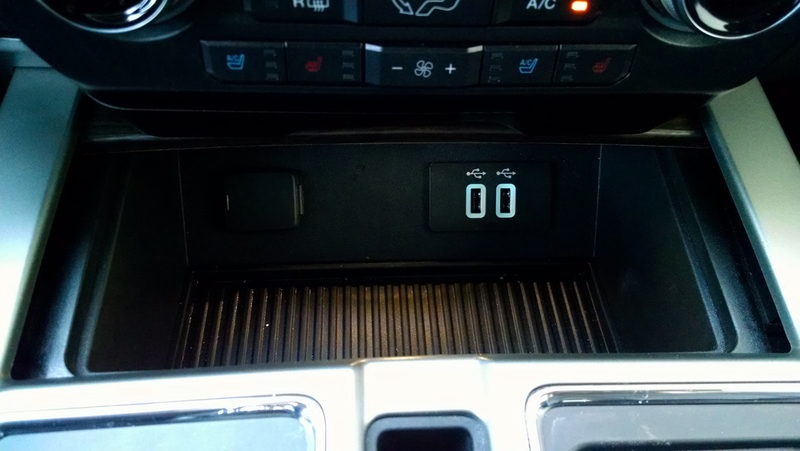 The latter is a night-and-day improvement over the old MyFord Touch system. The audio quality is good too. 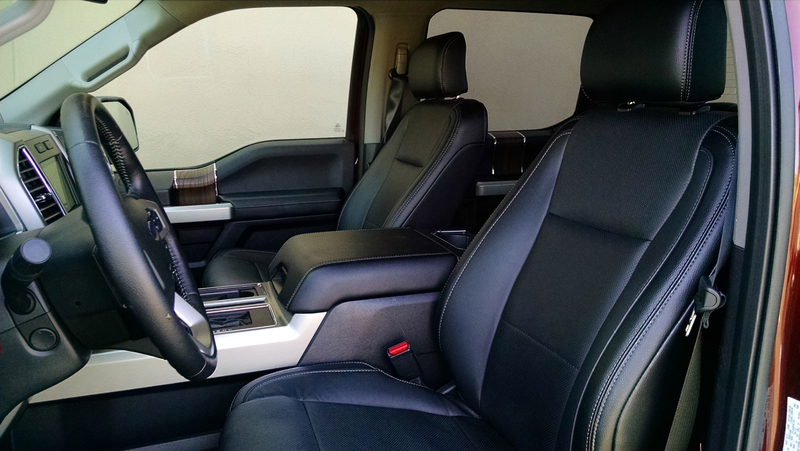 The front seats are plenty comfortable and offer a wide range of adjustments. 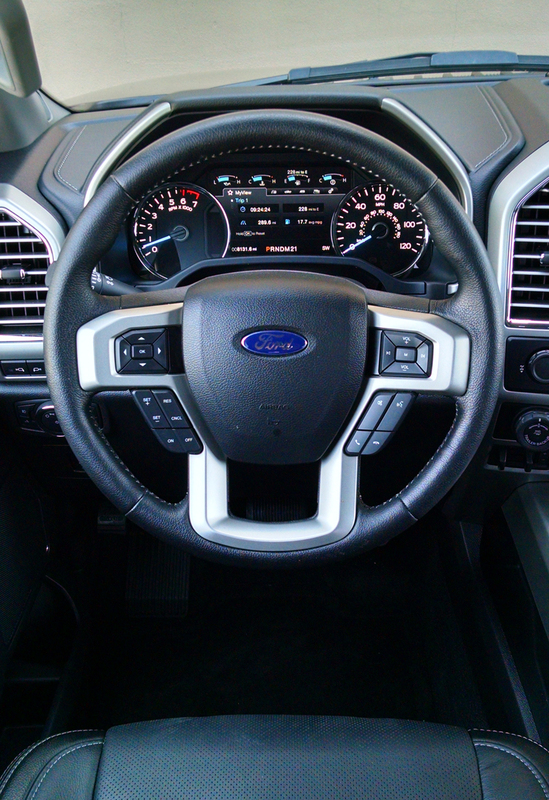 Both the steering wheel and pedals are power adjustable as well, so tall or small Ford has your number. 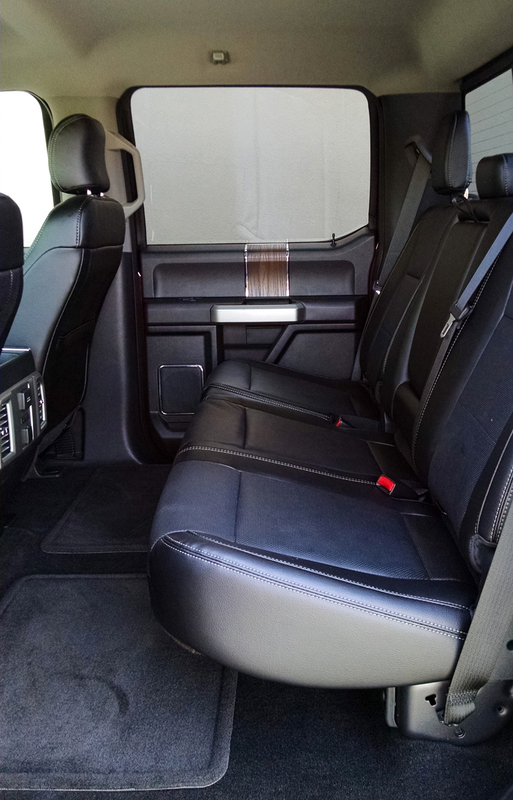 The rear seat however is fixed at a pretty low level, leaving your knees perched high. 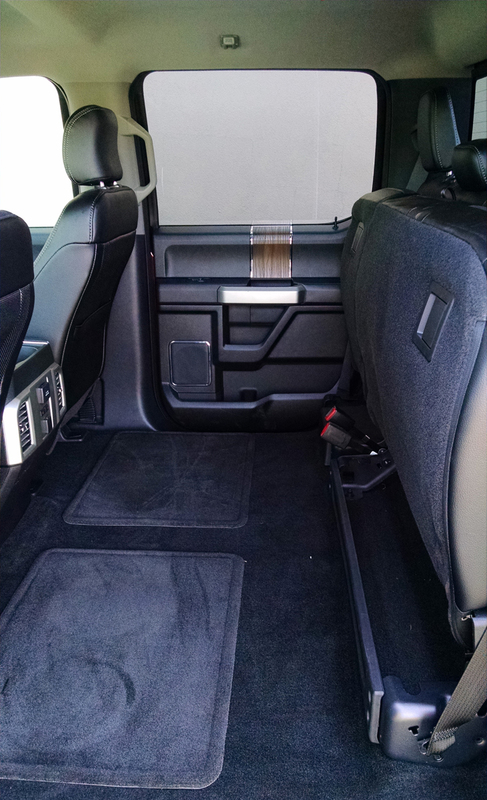 The seat does fold up in a 60/40 split to allow a nicely sized cargo area back there. And that gets us to storage which is down right generous with a large console bin under the armrest, side pockets in the console, and a phone caddy ahead of the shifter with all the connections you need. 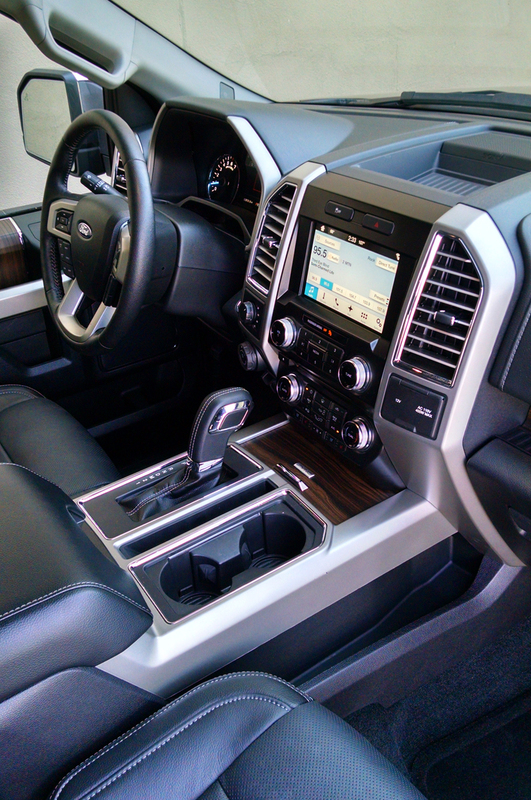 If any complaint comes of the cabin it’s Ford’s typical inattention to material quality. While there are some good pieces and parts here, there remain next to them some awkwardly cheap pieces that look like they are from another vehicle. 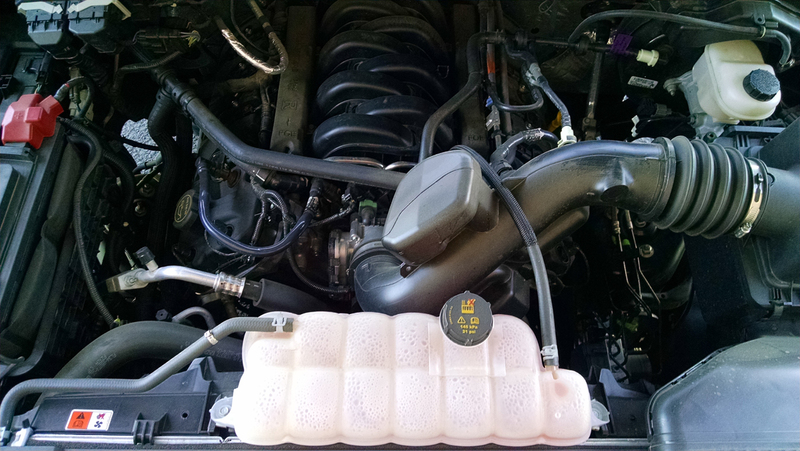 Most pickup truck buyers however will be most pleased with its 5.0 liver V8, not far from the one that burns rubber in the Mustang GT. It’s detuned here slightly with 385 horsepower and 387 pound-feet of torque. 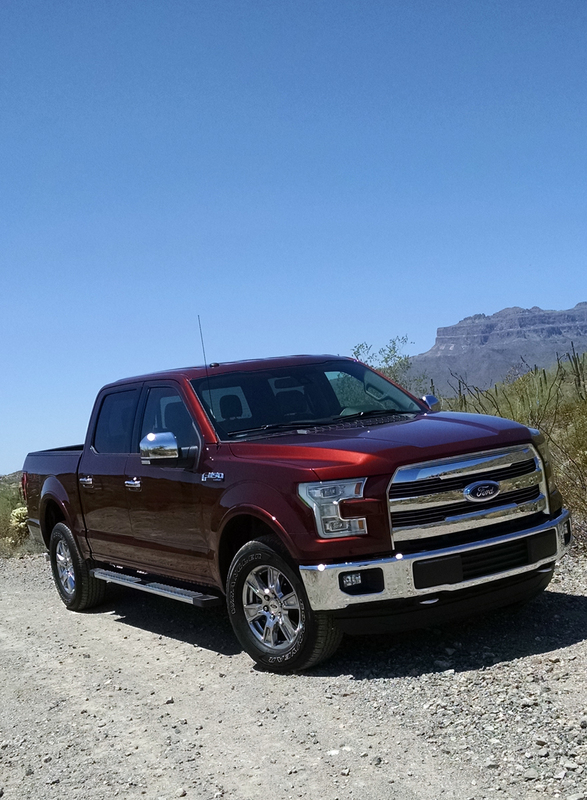 Mated to a 6-speed automatic transmission with both a sport and tow/haul mode, it still moves the truck quickly though. 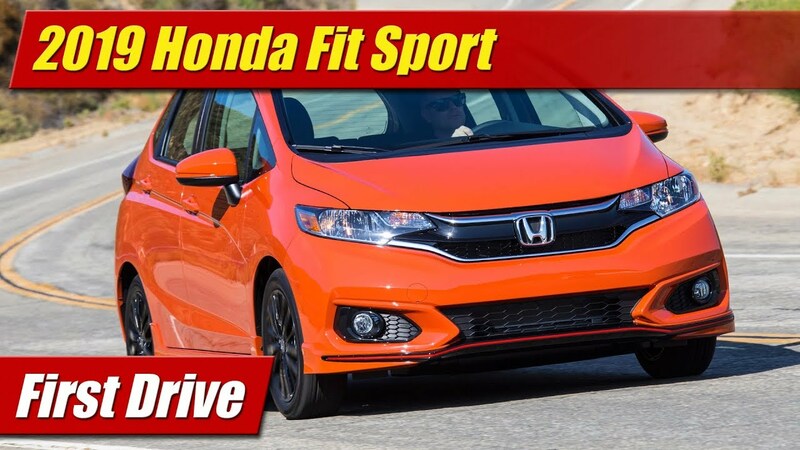 While its sound will likely sell it to most buyers, fuel economy isn’t bad either. 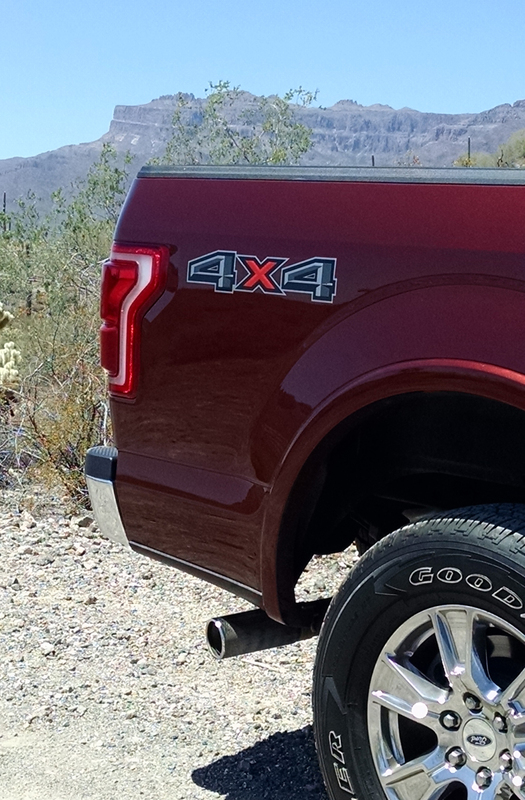 The EPA rates this truck as equipped with four-wheel drive at 15 mpg city, 21 mpg highway and 17 mpg combined. We achieved that 17 mpg combined in our week, right on target. 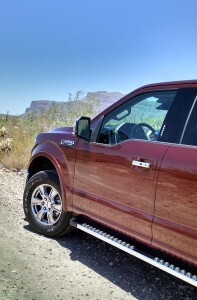 When Ford said the new F-150 would have an all-aluminum body, many worried it would feel flimsy driving down the road. 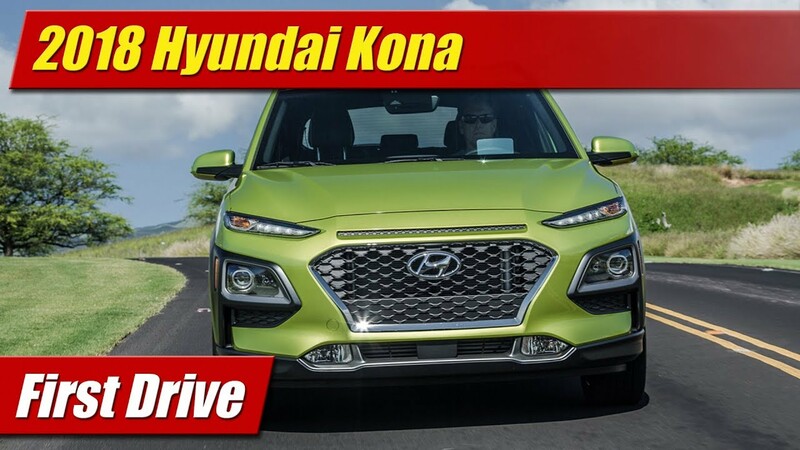 Yes, it loses 700 pounds, but will it feel like less a truck. The answer to both concerns is no. The frame that holds it all together is steel, high-strength steel that is. It’s more rigid and stout before and that aluminum body gives up nothing in terms of structural integrity. 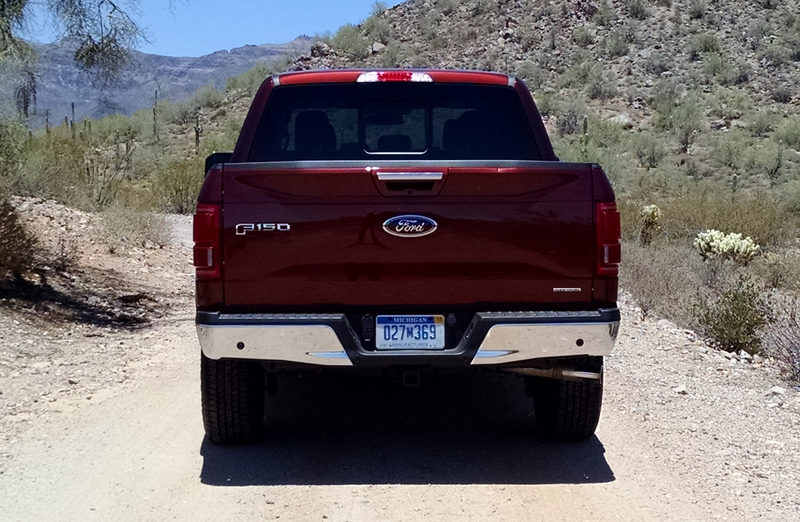 This combination of weight savings and strengths delivers a ride on the highway just as solid and quiet as before. Off the road the washboard desert paths and trails didn’t upset the apple cart either. 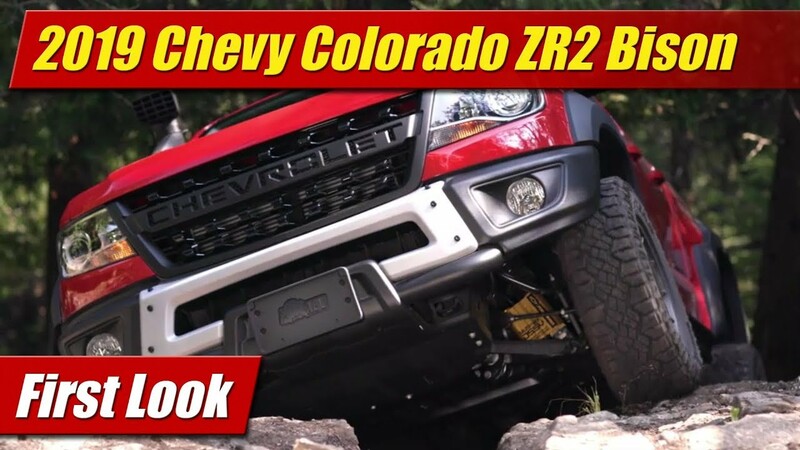 Blasting around in the rough, the F-150’s chassis and suspension exhibited excellent control, good isolation from the shocks and vibrations, and plenty of maneuverability in spot of its size. 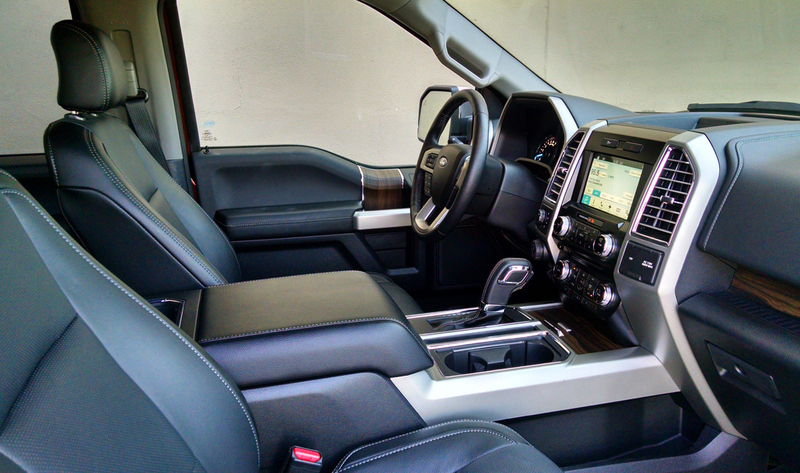 Most important the interior trims and body structure remained solid and quiet. 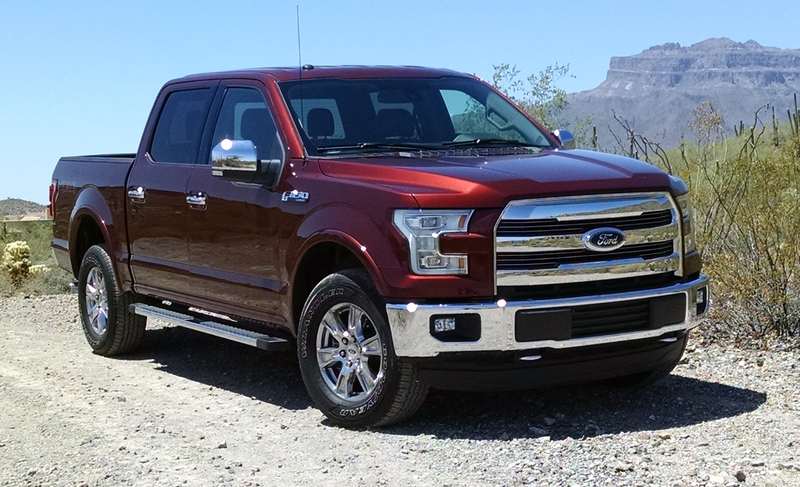 That brings us to the recent IIHS crash tests of all full-size trucks where this Ford F-150 was the only of the bunch to achieve a Top Safety Pick status. So much for the argument aluminum body structures are flimsy. 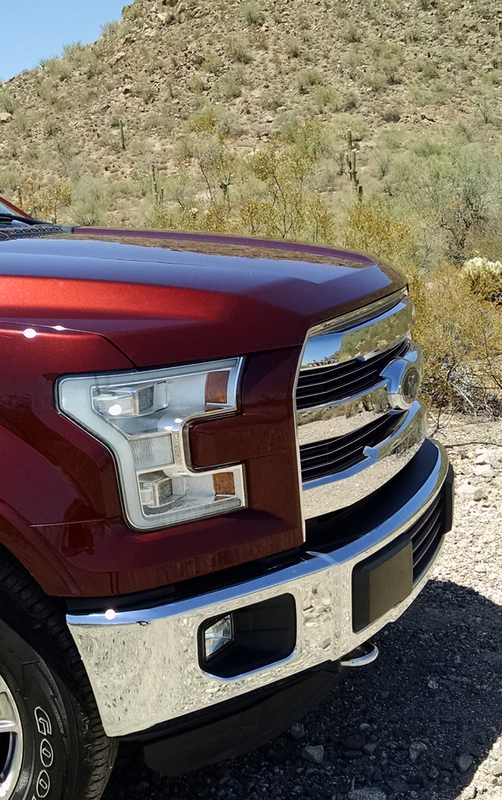 While this F-150 impressed us well with is punchy and prowling drivetrain and its refined driving character, build quality still shows a few areas for improvement. Body alignments here and there could be found amiss, and some materials inside still have no place in a $55,000 vehicle. In fairness however, full-sized American pickups have never been known for their Honda Accord like build qualities. 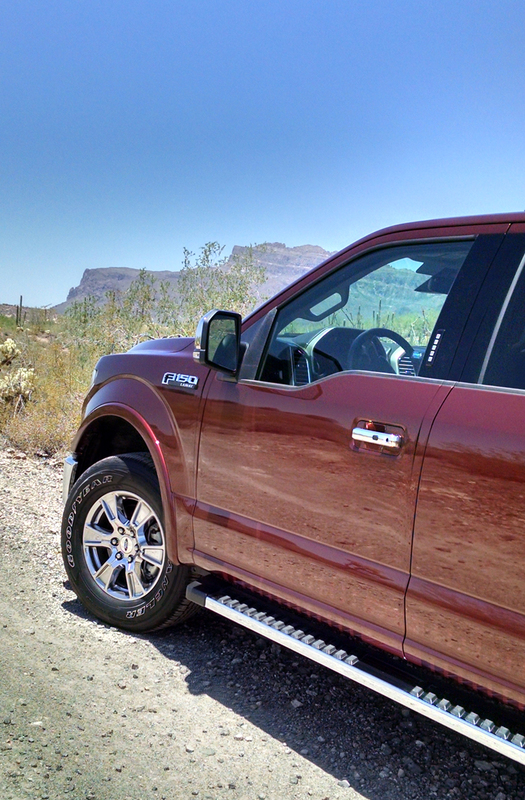 What we do come away with is that this is indeed the best Ford F-150 to date in virtually every measure. And while the EcoBoost V6 engines do get all the headlines these days, the 5.0 V8 remains a nice mid-range choice for the traditionalist.